Do you know the days when it's rainy and highly uncomfortable outside and you just can't wait to snuggle up on your settee with a hot cup of tea? Or when it is a boring and lazy Sunday, nothing is on at the cinema and you can just spend ages watching The Big Bang Theory and plan some blog posts? For those days comfy pyjamas or bottoms are perfect so today's OOTD post might be a bit unusual, but I'd like to show you my newest pair of comfy loungewear* from Your Dreamcatcher, a brand which sadly no longer exists but, I still would love to show you my OOTD as they send me a super comfy pair of bottoms from their range. 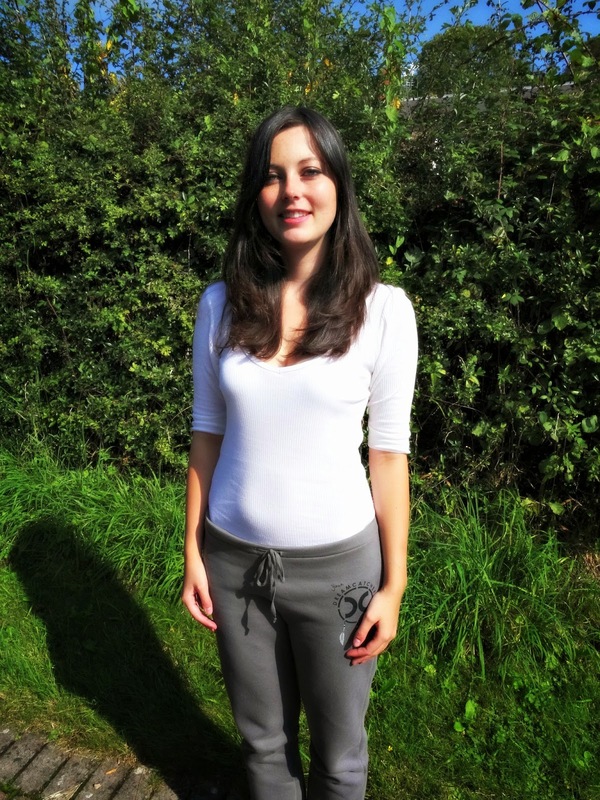 British brand Your Dreamcatcher creates casual women's leisure and loungewear. Their collection features vests, T-shirts and jewellery which all reflect the concept of 'the dream'. I was kindly sent a pair of joggers to review and got them earlier this month. Whenever I had the chance to wear them, I did, which was literally as soon as I came home. So for the last two weeks, I wore them constantly. Whether to snuggle up on the settee or to keep me warm at night (it does get really chilly now that it is autumn). The grey bottoms are made of cotton and polyester and inside they are fluffy. The joggers are nicely tailored and have a great fit. They feel super comfy and aren't baggy at all. The waist has a drawstring and the legs are finished with elastic cuff at the ankle which makes them easy to roll up. Combined with a white vest or shirt, these joggers are very casual to wear and the logo on the top left underlines the look. If you haven't heard of Your Dreamcatcher, why not check out their website? Their affordable range starts from £8 onwards and the bottoms came £27.99. Thank you so much for reading today's post. Do you like loungewear and what do you like to wear on a lazy Sunday?